Whenever 'tapas' and 'Spanish' are mentioned, my mind immediately conjures up images of meagre offerings for exorbitant prices. I was pleasantly mistaken upon visiting En Casa, which serves up generous portions for more affordable prices. Don't let the narrow shopfront deceive you, either, as the restaurant could easily sit a few groups of 5 - 10 (which is fantastic when you want to sample loads of high-fat dishes in one sitting!). I started with the sangria, a cocktail of red wine, chopped apples, and what was probably lemonade (of the carbonated variety). 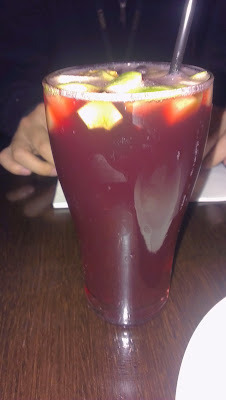 Light, bubbly and a tad fruity, it was a good complement to the procession of dishes that ensued. 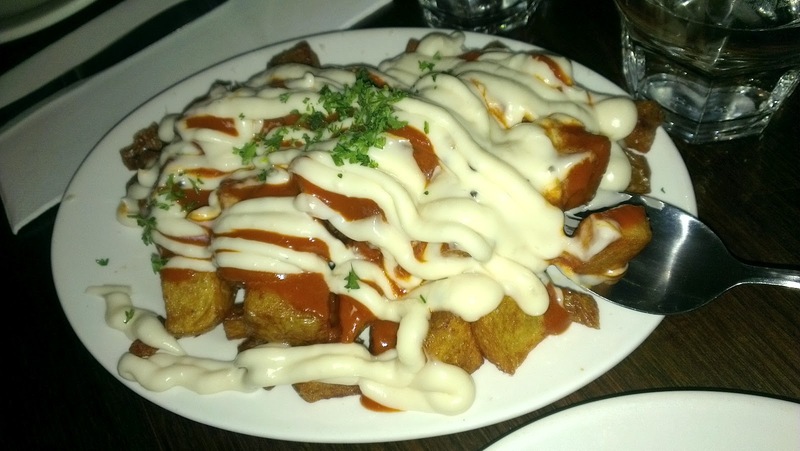 The first to arrive was the patatas bravas - fried chopped potatoes coated with garlic mayonnaise and tomato salsa. Crispy on the outside and soft on the inside, it was a carb-lover's delight. They overdid it on the sauce, but the excess was scraped off easily enough. 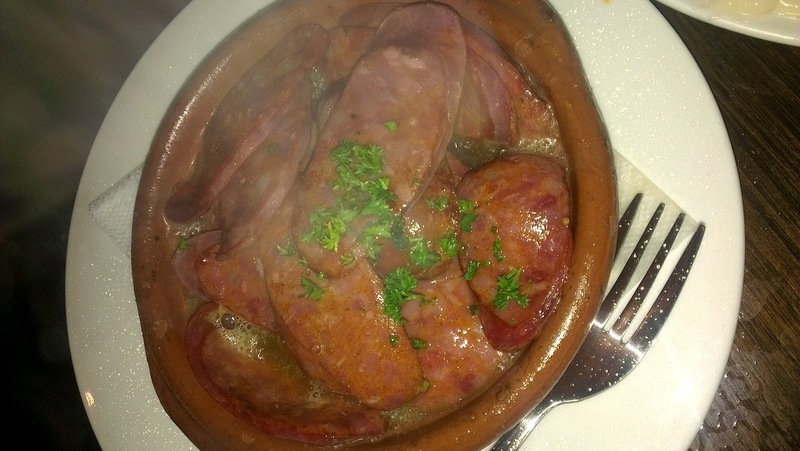 Next up was the chorizo a la plancha, or grilled chorizos. It was hot, bubbly and fatty, but oh so delicious. As with the potatoes, I had to limit my chorizo-intake to a little bit at a time. 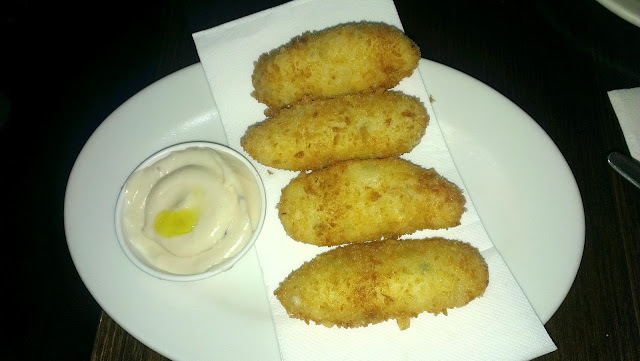 The potato and corn croquettes (above) were on the Specials Menu. As you can see, they came with their own cream sauce. They're similar to the Japanese ones, with their lightly battered, crunchy exterior and their mashed up interior. 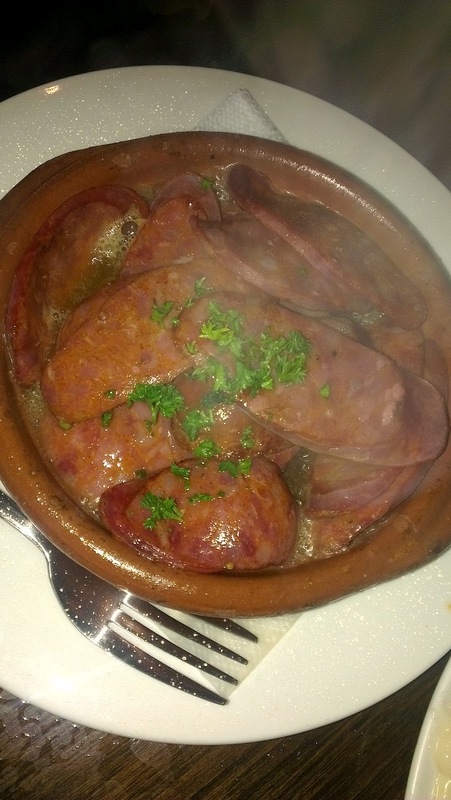 We also ordered an egg dish (the name of which has escaped me), which came with slices of buttered bread, mushrooms and chorizos. 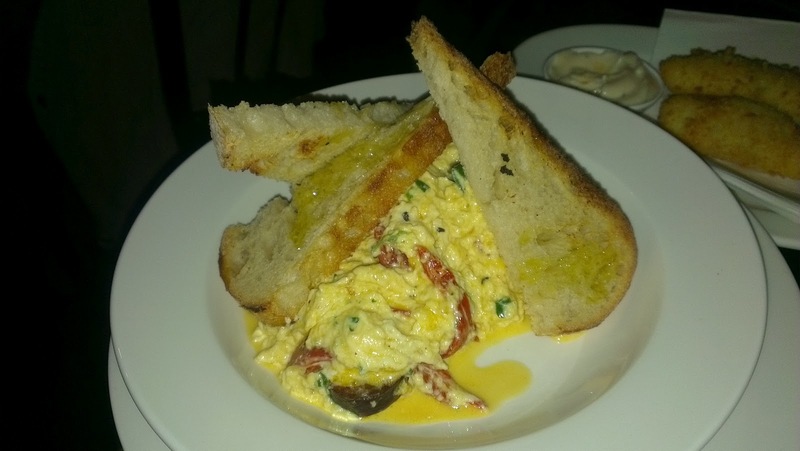 It was a hearty breakfast dish and very much complete on its own. Below, you can see the vieiras en azafran, scallops sitting on shells with a saffron, shallot and cream sauce. 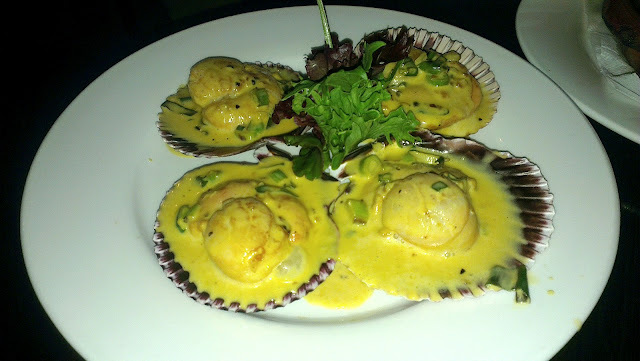 The scallops were firm but not tough and overall cooked really well. That was probably the highlight (along with the potatoes!). The five dishes and drink amounted to $66 for two. I don't eat Spanish often so I'll leave it up to you to make a judgment as to whether that's reasonable. I should also add that one should take into account the need to balance dishes. If your palate isn't overwhelmed by the amount of oiliness, creamy sauces and sausages, your stomach might be the one to protest not too long after! Service-wise, the food came quickly and the waitstaff were efficient and alert. Don't expect too much in terms of ambience, as it can get pretty loud and busy - though some might regard it as a manifestation of the casual dining atmosphere.